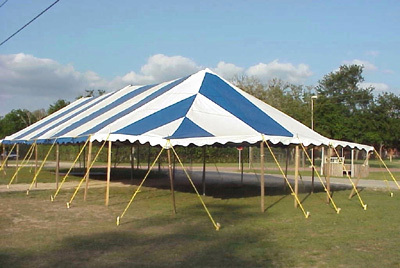 This item is the laminated vinyl canopy for a pole tent and is built to last through multiple deployments in commercial and industrial use. The fabric is 14-15 ounce heavy-duty "Block Out" vinyl that comes in solid white or in white with a variety of translucent colored stripes. The entire perimeter of the tent has 2" seatbelt webbing for stability. The tent comes with its own protective bag. A 1-year manufacturer's warranty applies to this item.